There has been much talk recently about egg-laying geckos that also occasionally reproduce parthenogenetically. 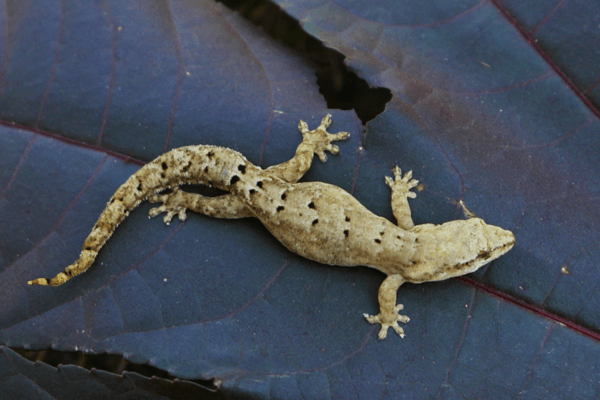 Today’s article, however, focuses on “obligate” parthenogenetic geckos, i.e. those who are ‘obligated” to reproduce asexually. These geckos are generally quite small and live in desert or near-desert climates. Incidentally, the process of asexual reproduction is called “parthenogenesis” and the adjective has been rendered both “parthenogenic” and “parthenogenetic”. We have chosen to consistently use the term “parthenogenetic”. 1. Which species are you keeping? 2. What got you interested in this (these) species and where did you get your first one(s)? 4. What do you find most interesting about them? 5. What do you find to be the biggest challenge? I love parthogenetic reptiles and have kept a few different species over the years. At this time I am keeping Heteronotia binoei and Lepidodactylus lugubris. For the purpose of this article, I will focus on Heteronotia binoei. I have loved keeping parthogenetic reptiles since I got my first H. Garnotii in 1984. 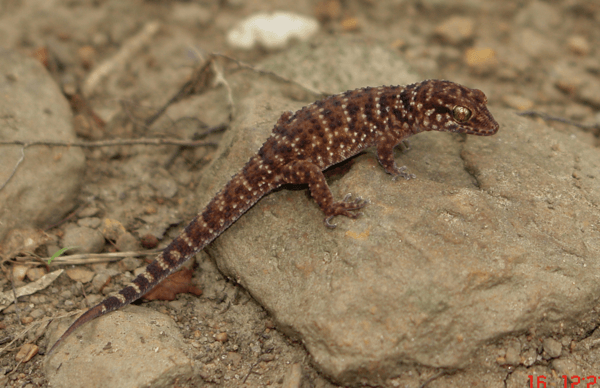 I saw my first Heteronotia Binoei at the 2010 Tuscon AZ reptile show and thought it was just an amazing little gecko. I considered buying 1 or 2 from the vendor who had them after the show was over, and on the last day of the show that vendor came to my booth and offered a trade. Jason Smith is a pretty great guy and breeds exclusively Australian reptiles, and I was surprised when he asked to trade a H. Binoei for a Leopard Gecko. I made the trade and got one of my favorite species ever in return. I have my 3 little sand geckos set up in a custom 33 gallon tank with 3” of natural sand and sandstones for climbing. I use a large flat sandstone under the sand over the UTH to provide an even thermal gradient for them. The sand is soaked with water then allowed to dry so they can build little caves and tunnels. A 100w light is kept on during the day and no lights are used at night. I keep a shallow water dish full of river rock in the tank and mist them nightly. I try to keep day temps 95-100F and night temps no lower than 70F. Humidity stays low with spikes from misting. I set up juveniles on paper towels with sandstone rocks to climb on. They have the most fascinating social behaviors. Adults will chirp and tail-wag at each other. They also raise their tails and wag excitedly when hunting. At first getting them to reproduce was the biggest challenge. They will not begin to lay eggs until they believe it is the rainy season. Simulating a decent rainy season was a little tricky at initially, but eventually I got it right and they started laying. Getting eggs out of the enclosure proved tricky as they are very thin shelled and fragile. The trick I found was making a custom sand sifter to collect eggs and set them into a cup for incubation. 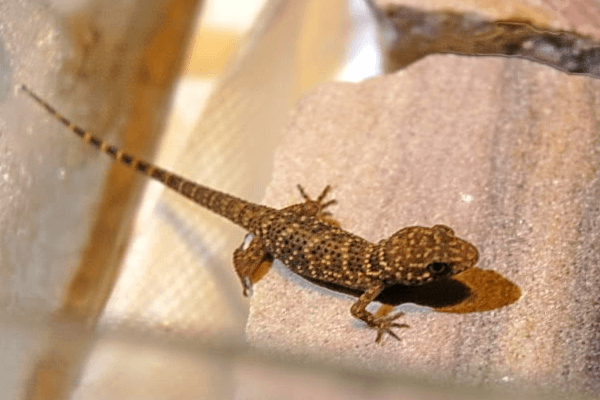 I have kept and bred all of the known asexual gecko species that have been in captivity, including Hemidactylus garnoti, Lepidodactylus lugubris, Hemiphyllodactylus typus, Nactus pelagicus and Heteronotia binoei (I have also bred the sexual form of this species which is currently quite rare in captivity!). Currently, I am only keeping and breeding L. lugubris, H. typus and H. garnoti. My first parthenogenetic gecko species was Heteronotia binoei which were received in an exchange from a veterinarian doctor, Mike Miller, from Chicago, IL in 1982. Mike had purchased his two H. binoei from an import in the mid 1970’s, the year before the Australian wildlife act was implemented, so these 2 specimens were wild caught and legal imports! Mike had the animals for nearly 9 years when we discussed the exchange and he laughingly stated “you have no chance in breeding them, because they are 2 females”. I was young and inexperienced and just felt privileged to at least keep another new species. I ended up exchanging some captive born Teratoscincus scincus to Mike and he sent the animals to me. After they arrived, I pampered them with every meal and probably overfed the poor animals, but after about 6 weeks I noticed that one of the females was ovulating and in subsequent days they fully developed and she laid 2 good eggs. A couple of weeks later, the other female began developing eggs. Stunned by this, I telephoned Mike to discuss what would prompt these females to lay perfect looking eggs. Sperm storage? He replied “they’re infertile” – as I have never had a male in the 9 years that I owned them!”. The eggs looked perfect though! I incubated them in dry substrate in the closet of my dormitory room at Oklahoma State University and 2 months later hatched out two perfect juveniles. Incredibly, it was not until 1989 that Moritz published the discovery of parthenogenesis in Heternotia binoei! Living and learning my own discovery 7 years before the Moritz’s publication was certainly a very enlightening experience for me as a new gecko keeper/breeder! 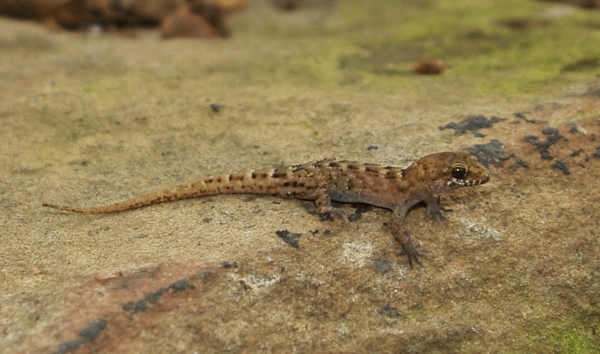 Hemidactylus garnoti – 1-2 females can be kept in a terrarium with the minimum dimensions of 12 inches cubed. Dry substrate, potted plants, cork panels, tree branches, bamboo poles, etc., are included. Temps of 75-85 are steadily maintained and with very little seasonal fluctuation. Water dishes are always available, and for all of my other geckos as well. Lepidodactylus lugubris – 1-3 females can be kept together, but the terrarium should be accordingly larger as the number of animals increases. They can be kept identically to H. garnoti, but enjoy slightly higher humidity, as this will help increase hatching percentage of the eggs that these animals will glue to the walls and fixtures of the terrarium. They can be fed the typical insects and also relish fruit-based mixtures and yogurt. Hemiphyllodactylus typus – I keep 1-2 females in a one gallon plastic jar with plastic plants and coco fiber substrate. Temps of 75-85 F. should be maintained for most of the year. I lightly spray the jars 2-3 times per week. Nactus pelagicus – a single female can be kept in a single terrarium that should be a minimum of 8 inches cubed, and add 3-4 inches to this measurement for every additional female. Higher humidity of about 50-60% will benefit these animals, but they should be provided with drier hide spots. This is opposite to most people’s understanding of keeping something dry and providing a moist hide spot. A substrate of sand/soil (coconut fiber works well too) to a depth of about 2 inches should work well for them. Provide a lot of ground cover and branches that have loose, friable bark pieces, as the geckos will prefer to hide here. Temps of 75-85 should be maintained every hour of the entire year. Heteronotia binoei – can be kept in a rack-system with a floor space of 8-10 inches squared being sufficient, and an additional 3-4 inches added to this for every additional female. Dry sand, or sand/soil mix, can be utilized, with a few plastic hide dishes, bark, thin rocks, etc. for ground cover. Temps of 75-90 F should be maintained during the 8 month long active season. Occasional spikes in humidity (misting twice a week) is beneficial, especially at nightfall, as this has a natural stimulation for desert dwelling ground geckos to elicit stronger feeding responses. 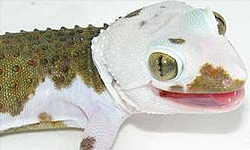 The geckos should be kept about 10-15 F cooler, night and day, during the inactive, non-breeding season. The most interesting aspect of all of these unisexual species is the interaction among multiple females in a given terrarium. Female L. lugubris will readily display relict breeding behaviors whereby females will call to each other, licking the air fanatically in an effort to pick up pheromones and signify the onset of hormonal increases, while waving their heads back and forth when approaching each other. As if that is not bizarre enough, some females will actually bite the neck of other females and occasionally lift the tail of the submissive female and bring their vents into contact with each other. It’s really made clear that the mutation to a unisexual existence is genetically fixed, however the instinctive behaviors are not! Nactus pelagicus will occasionally chirp in the presence of other females, and whether this is an advertisement call, or territorial, is not known. L. lugubris – adult females will cull juveniles by hunting and eating them in order to keep social balance in the group. H. typus – the only issue with these are the small size of the newborns. I have found excellent success in rearing them in 32 ounce fruit fly cups that are kept under the same conditions as the adults. Nactus pelagicus – stable temps are mandatory for this species, as they can exhibit physical signs of stress with temps going into the upper 60’s/lower 70’s and likewise for temps above about 88-90 F.
These are all very rewarding and interesting animals to keep and the issue of not knowing the sexes of your offspring has been solved from the very first day you get them. 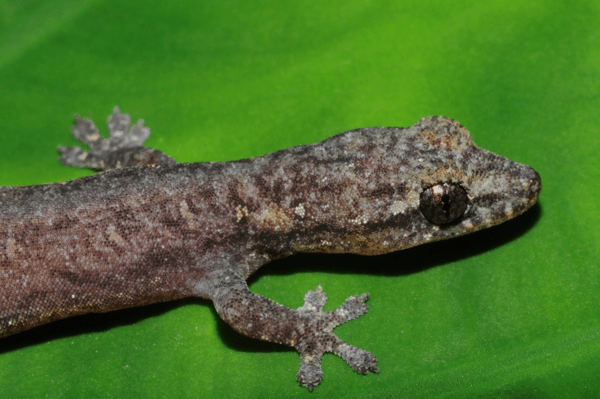 I’ve kept both mourning geckos (Lepidodactylus lugubris) and Bynoe’s geckos (Heteronotia binoei). Mourning geckos interested me as I got into poison dart frogs. This gecko is often kept in tandem with frog species in heavily planted terrariums. While I started keeping them this way, I moved them into their own cage within a few months and saw much more success. I started with two females from Black Jungle Terrarium Supply. Bynoe geckos popped up on classifieds from time to time. I’d never seen them and knew I really enjoyed keeping small geckos. I spoke a bit with the seller, and decided to give them a try. I started with three juvies from a breeder in Washington. I kept the Bynoe geckos in shoeboxes in my rack, warm with sand. The first breeding season I kept the females individually and only saw two to three clutches. The second season I kept the females together in a larger box. The competition increased production to four to six clutches per female. Neither gecko is very handleable, but both are a joy to watch. Mourning geckos are a bit more elusive, but in a heavily planted tank you can enjoy seeing them out and about from time to time. Bynoe geckos are not very shy, but they are fast. They strike prey like a monitor and aren’t afraid to go after their food. The biggest challenge with mourning geckos was removing eggs. I resorted to capturing babies from the cage when I saw them. I believe the female may have eaten some babies I missed. The biggest challenge with Bynoe geckos was selling them at “market price”. When a gecko reproduced very easily it often will not hold market value. I believe we’ll see these geckos go for $50-75 in the next season, down from $100-150. In the next two to three seasons I wouldn’t be surprised to see the prices rival pictus geckos, around $35-50, as more people produce them. Jon Boone has kept and bred approximately 550 different species of geckos since 1981. He has also had the fortunate opportunity of finding approximately 150 different species in nature from more than 25 different countries around the world. Combining field experiences with a captive collection provides him with what he feels are unique perspectives into the lives of the animals that we all keep and study. Jon might also be one of the only gecko people in the world to have been featured in a People magazine article! His website www.jonboone.com also provides the collective community of zoologists, researchers and hobbyists with a vast number of photos from live geckos he has kept and bred over the years. Matthew Kammerer started Gecko Time in 2009 after keeping and breeding multiple gecko species in high school. During college he spent his time curating a list of ‘must-have’ species when he graduated. After graduation he moved to Cambridge, MA where he’s spent the last two years breeding his dream gecko species, from P. rangei. to E. agricolae. In the last year he has discovered a love for amphibians, now keeping multiple dart frog species. Frog Time, anyone? Dan Martindale has been keeping herps since he was 8 and loved working with various lizards, geckos, skink, frogs and toads and many others. 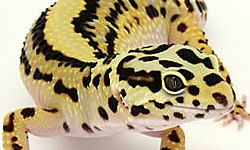 Currently he has a small business and hopes to offer a wide variety of captive bred reptiles. 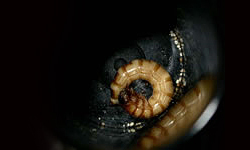 He does not raise his animals on a simple diet of just 1 bug; his critters enjoy a varied diet of about 5 regular prey types and a few extras like Silkworms now and then. He is currently working with Leopard geckos (Eublepharis macularius), crested geckos (Rhacodactylus ciliatus), flying geckos (Ptychozoon kuhli) and mourning geckos (Lepidodactylus lugubris). He is a co-owner of Chaotic Nights Reptiles. One day he hopes to be able to do what he loves for a living and a hobby. I think that a friend of mine had parthogenesis with ptenopus garrulus maculatus. Anyone else experience with this species? Jody, there have been a few other very rare occasions where a sexual population has randomly produced a triploid, asexual, offspring. The real test is to see what happens with the fertile (?) young from these random occurences. But, these exceptions are not categorically considered to be “true asexual species”. It has happened with leachianus and a Pachydactylus that I’m aware of. Thanks for the informative read. You guys never fail to let us down. I definitely learned something new today! No I haven’t. I’ve heard of it in gargoyles, crested geckos and leachies. However, I had a bearded dragon that laid an egg and even though it wasn’t a live hatch, the baby was fully formed. I had never heard of this in beardies before, so maybe it could happen with a leopard gecko. Remember, though, that if the gecko was with a male the previous season, it’s theoretically possible that she could store sperm and produce a fertile egg the next season.